January 3rd, 2018 | Moving Tips, Packing Tips. Winter isn’t the most popular season for moving, due to both weather concerns and the interruptions of the holidays. However, that means that you can sometimes find great deals on leases or home sales during the winter months. If you decide to take advantage of those deals, you may find yourself planning a cold-weather move. 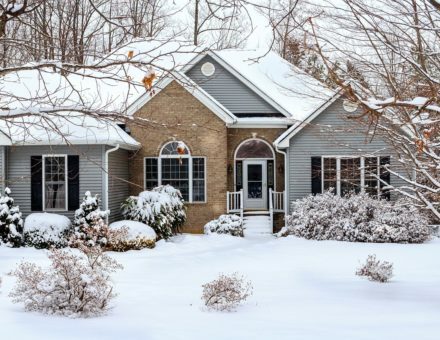 Moving in the midst of cold and snowy weather can come with challenges that you don’t face during the warmer months of the year. Take a look at some helpful tips for a successful cold-weather move. One thing that many people don’t realize is that the cold can make items that are already fragile even more brittle than usual, which can lead to cracks and breaks. Antique glass, for example, can crack from the stress of moving from a warm house to a cold moving van or vice versa. Moving vans are generally not heated, so you’ll have to take extra care when packing to protect glass and other fragile items from these temperatures changes. Use more padding than you usually would when you’re packing fragile items. Blankets work well for padding —they will not only protect the glass from bumps and scratches but also provide insulation. If you have room in your car, you may want to pack small pieces of glass that you’re especially concerned about in there, instead of putting them in the moving van. That way, you can keep them in your heated car and bring them directly into the new house, cutting down on the temperature changes of a cold-weather move. If you are concerned that a glass piece got too cold when moving, the trick is to warm it up slowly instead of bringing it straight into your heated home. Wrap the item in blankets and put it in the garage for half a day and then to a less-heated part of the home, like the laundry room or basement, for another half a day. Finally, bring it into the house, but leave the blankets over it for a day before unwrapping. Once you’re settled in your new house, it might be cozy to turn on the heat and watch the snow pile up outside. But during a cold-weather move, snowy and icy driveways and sidewalks are a recipe for injuries and broken household goods. Make sure that your sidewalks and driveways are clear and safe before you start moving items out of the house. One simple way to remove snow and ice or prevent it from sticking to the concrete if you expect snow on moving day is to make a brine deicing solution. You can do this by mixing rock salt and hot water in a bucket and spreading it on the snow, ice, or concrete. If you’re moving locally, you should clear the snow and ice from that property as well. Ask a family member or friend to take care of clearing the sidewalks and driveways at the new property while you’re loading up the truck at the old property. You may be dealing with bad weather as well as cold weather. Whether it’s snow, ice, or just cold rain, you and your movers are likely to be getting your feet wet as you load and unload the truck. Wet shoeprints can wreak havoc on your carpets and floors. Tracking in rain or snow can also make your move more dangerous. It’s easy to fall on slippery wet floors, and it’s even easier when you’re also carrying heavy boxes and bags. Therefore, take steps to not only protect your floors from rain and snow but also protect yourself. If you’re moving yourself, your best bet is to put something over your floors to protect them. Professional movers should automatically provide this service for you. Tape heavy-duty paper over your hardwood floors, and put rug runners on your carpets. Make sure that you put a doormat in front of the doors, and remind movers and family members to wipe their feet before coming in. Don’t put plastic covers over the floors. It may protect your floors, but plastic is already slippery and can cause trips or falls when carrying heavy furniture. It will become even more slippery when wet from rain and snow. Make some hot chocolate, coffee, or hot apple cider to offer your movers or any friends that are helping you make the move. Your movers probably aren’t getting paid extra to deal with cold and snow, and a hot beverage is a nice gesture that will give everyone a chance to thaw out a bit from your cold-weather move.